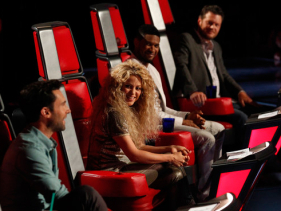 Season three of "The Voice" showed off its stellar top 10 in a night of highs and lows on Monday. Despite the tornado tragedy in Oklahoma that was unfolding during the live show, contestants and coaches, including a sedated Blake Shelton, continued with strength and prayers for the devastated region. The music of the night did manage to lift spirits, and so did the return of guest mentors including Pharrell and Cee Lo Green. While there were no real fails, the usual suspects did stand out. Being Michael Jackson's background singer can be a double-edged sword as Team Adam's Judith Hill found out. After receiving accusations of exploiting her connection to the late pop star, Hill was "torn" about her coach's decision to have her sing "The Way You Make Me Feel." The sincere artist put aside her feelings and performed a jazzy, sensual rendition of the super hit that even enticed host Carson Daly to comment, telling her her performance was "a big part you paying homage to somebody in your life and you being you." An equally touched Usher added, "I miss him." The queen of ballads finally let her hair down by taking on current chart-topper Emile Sande's "Next to Me." An ever-radiant Sasha Allen brought forward a good balance of musicality and pure joy that had coach Shakira literally on her feet, rocking out in a manner Shelton described as a "fit, of some sort." All four coaches were happy to see an often demure Allen have fun, prompting Shakira to exclaim just how "freaking proud" she was of her artist. Sarah Simmons stands out among Team Adam's talented female roster because of the sheer uniqueness and control of her voice. In the past she has been touted as having one of the best voices they have ever heard, and last night, Simmons did not disappoint. The usually ethereal singer flipped the script by channeling her inner rock goddess with Jessie J's "Mamma Knows Best." "If you got it, you got it," Usher told the powerhouse vocalist, while Shelton was taken aback by Simmons' sexiness. Team Usher's Michelle Chamuel definitely gave fans a reason to vote for her last night with a killer performance of Pink's "Just Give Me A Reason." Her emotional performance brought her down to her knees twice and Usher to his feet. "It's just you — you are the theatrics, you are the vocal, it's just you," Usher proudly told his mentee. But it almost doesn't matter how she performed, because during rehearsals alone guest mentor Pharrell told Chamuel that of the "genius, monster singers who are going to have a career ... you are one of them." Need we say any more? Live shows continue Tuesday night (May 21), when two more contestants will bite the dust.